Thank you to all who are a part of the Mifan Mommy Club. Your monthly donation of $9 is helping children and disadvantaged adults in several areas of China. I’ve attached some pictures from the Anhui Children’s home (check out the kitchen that feeds a LOT of children and adults!) as well as a short note from our volunteer, Julie, cut from her monthly report. We are soon all heading towards the dining room where we hear music and as I strain to see over the top of heads I see two of the girls who are about 10 or 11 dancing with the Red Cross support group. As the music stops, Katja and I are grabbed and persuaded to sing for the children: we do our rendition of ‘heads, shoulders, knees and toes’ along with the actions and then we join the support group and everyone else with the Chinese Happy New Year to You. It was wonderful, not a dry eye in the house, this is proving to be a very emotional day. No sooner had the music stopped and every one of the children are lining up for lunch. This is a very special lunch and one we can thank you our supporters for, as we, with your help have donated money for this special meal, which we all shared together as one very big happy family. After lunch it was time for MiFan MaMa to give red envelopes to the Mummies and Daddies on your behalf, what better way to let them know we really appreciate all they do on a daily basis for these children. During all this time there wasn’t much time for game playing or painting with the children but the people from our bus were busy visiting those children that cannot get out of bed, those who stare at four walls and a ceiling all day and never complain. Thanks to King Koil these children are comfy in the mattresses they have especially made for them. We then had a time of exploring and getting to know the children and where they live; a very precious time. These children have come to accept us as their family as have their Mummies and Daddies. Communication is always a small problem, just a feeling of small frustration on our part but love soon shows us there are no barriers – everyone wants a hug and very soon get it. Everlasting friendships are forged, just as all from our bus will not forget these wonderful children; the children will never forget them and their love and kindness. We all pose for photos – everyone wants to capture this very special moment. The volunteer from the Red Cross tells Katja and myself about a family who are all very severely ill. We agree to supply food for this family as they have no money and their plight has already been shown on Chinese TV. (Roy has already investigated this, so we know there is a real need). We give the Red Cross Volunteer enough money to buy this family rice, flour and oil for 6 months. In addition we are able to give them a bag of rice, flour and a bottle of oil from Lao Wang’s supply. The man from the Red Cross asks that we deliver these items personally on the way home: he assures us it is on our way. So we agree and he joins us on our bus with 3 volunteers for our return journey. All too soon it is time to say goodbye to everyone and lots of tears are shed on both sides. Although we will be back in one month and these children and everyone here has a place in our hearts it is still so sad. One of the Mummies is hugging me crying and thanking us for all we do. I tell her it is us who thank them as they are the ones who look after these children 24 hours a day, everyday. They are the one who teach these children love and caring by their example, how lucky these children are for although their possessions are few their hearts are bursting with LOVE and CARING and SHARING. We have the privilege to have been a part of this, to have experienced this, even if only for a short time. Then we get on the bus some passengers are leaning out of the window sharing a last handshake with these wonderful people. Soon we are driving down the road, we wave, and they wave, and soon are just dots in the distance. The bus is silent: we have all had different experiences on this visit, each of us has our own treasured memories to take away until we visit the next time. We now have the Red Cross volunteer and his helpers on the bus, but on further investigation we find it will take us an extra 5 hours to make this visit to this family. Unfortunately this is not possible, as lots of people on the bus must get to work the next day and even now we will not arrive home until 12.00 midnight. We agree to sort the Red Cross team out another car and further down the highway we stop and there is another car waiting, we all exchange hugs and greetings for this family, and then we part. 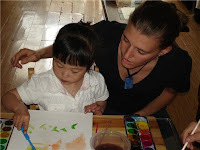 Below please find the December report from our China volunteer, Julie. Thank you, American Mifan Mommies for all you do! 3. What was the purpose of the trip? To make contact with the orphanage, hang out with the people, and make sure the Christmas gifts were delivered and handed out. There was reports of possible snow, so the plan was changed, we decided to go by train, instead of hiring a van. Because of that,there were cancelations on some of the participants of the trip. The trip allowed us to be here all day Saturday, meeting people and hanging out. We asked questions about the orphanage, the acting director, Guan and his wife, were very helpful in answering them. We were really touched by the way we were welcomed and received. We stayed at the guest room, the only room in the compound that had heat. Among the things we got to do were games, pictures, good conversations, etc. Angelina got to teach some English songs to the kids. The 2 TLC volunteers wanted to see about getting the money for purchasing 2 dryers for the small children and patients. The semi truck with the gifts arrived at about 7:45am on Sunday, the whole place was filled with excitement as gifts were being passed out to the individuals. There were also other donations like crocs shoes and other items. The directors and the staff really appreciate them. *to those of you who wonder what the Mifan Mommy project is, we are a group of online contributors who give a small monthly donation to support a non-governmental orphanage in Anhui. The orphanage was started by an elderly Chinese man who converted his abandoned manufacturing facility into a home for the unwanted. They do not receive government assistance but instead rely on the generosity of those who have heard his story. But he is the true hero in the story, as he opened his heart to receive those who had no where else to go. For our part as the Mifan Mommies, donations of $9 a month are given to help buy rice, as we found out that one bag of rice to feed the whole institute is only $9, yet for many years the residents only received rice on special occasions. Now they get it all the time! Little Anqi was found in this box in Yinshang along with milk and her xrays. 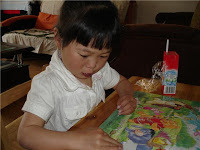 She was brought to the orphanage and the director allowed the China Chapter of Mifan Mommies to step in and help. Anqi –nicknamed Angie– is now doing well recovering from her emergency surgery for her intestinal blockage. The China Mifan Moms have set up rotations of sitting with Anqi now that she is post-surgery. Our chapter of Mifan Mommies in China successfully raised the funds needed to send little Huiming to the hospital for her 2nd heart surgery. This was a huge effort and they did such a great job! Congrats China Mifan Mommies! Attached are pictures of Huiming and one of our China Mifan Mommies.